This new fiber optic amplifier series provides high performance detection offering fast response times in high speed or low contrast applications. 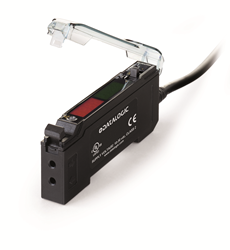 Datalogic S.p.A., a global leader in Automatic Data Capture and Industrial Automation markets, is pleased to announce the new fiber optic sensor S70 with advanced design and features. This new fiber optic amplifier series provides high performance detection offering fast response times in high speed or low contrast applications. Two models are available with different selectable response speeds: 200 μs (High Speed), 500 μs (Standard), 2 ms (Long Range) and 5 ms (Extra Long Range) for S70-E1, 10 μs (Super High Speed), 15 μs (High Speed), 50 μs (Fast), 250 μs (Standard), 500 μs (Medium Range), and 1 ms (Long Range) for S70-E2. The S70 has dual digital displays, showing both signal level and threshold simultaneously, and a bright output LED for easy programming and status monitoring during operation. The sensor is suitable for detections in reduced spaces thanks to its compact dimensions and it is easy to mount thanks to the DIN rail compatible format. All S70 amplifiers work with any Datalogic 2.2 mm fiber optic cable, which will allow for several operating distances according to their design and application. The S70 fiber optic sensor features a single discrete NPN or PNP output, and a model with IO-Link interface* is also available. The S70 enhances the Datalogic fiber optic amplifiers series, ensuring reliable and stable performance as well as full control over all operating parameters through expert Teach and Set methods. The new products will be available for sale starting from October 2014 and from that time on purchase orders can be entered in SAP and processed according to the standard procedures. Datalogic Group is a global leader in Automatic Data Capture and Industrial Automation markets. As a world-class producer of bar code readers, mobile computers, sensors, vision systems and laser marking systems, Datalogic offers innovative solutions for a full range of applications in the retail, transportation & logistics, manufacturing and healthcare industries. With products used in over a third of the world’s supermarkets and points of sale, airports, shipping and postal services, Datalogic is in a unique position to deliver solutions that can make life easier and more efficient for people. Datalogic Spa., listed on the STAR segment of the Italian Stock Exchange since 2001 as DAL.MI, is headquartered in Lippo di Calderara di Reno (Bologna). Datalogic Group as of today employs about 2,400 members of staff worldwide distributed in 30 countries. In 2013 Datalogic Group achieved revenues of 450,7 million Euro and invested over 35 million Euro in Research and Development with a portfolio of over 1,000 patents across the world. Datalogic and the Datalogic logo are registered trademarks of Datalogic S.p.A. in many countries, including the U.S.A. and the E.U. Datalogic ADC is a trademark of Datalogic S.p.A. Skorpio is a trademark of Datalogic ADC S.r.l. All other brand and product names are trademarks of their respective owners.